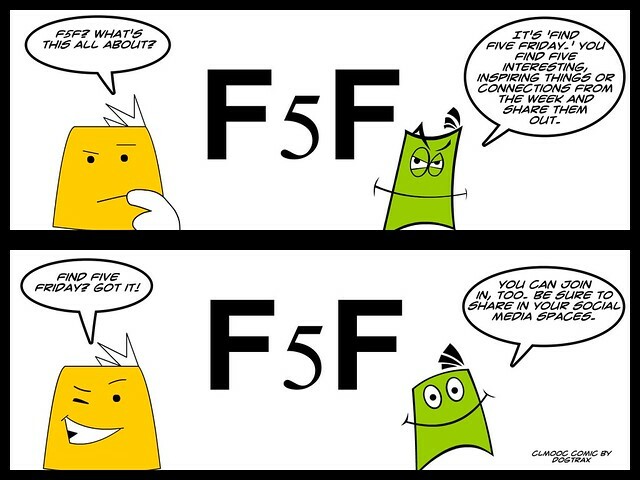 Each Friday at the CLMOOC, we encourage folks to take a look back at the week behind and find five things/people/projects/collaborations/whatever to highlight as a sort of end-of-week reflection. Scott Glass launched a collaborative slideshow that asked folks to “remix” their working spaces with images. Some made photos within photos, and others added creative touches. It was a neat idea. Susan Van Geldar had been working on an image of her set of Recorders, and then, after queries from the CLMOOC community, she created a ThingLink with some information layered on her image. That wasn’t enough for us. We asked to “hear” the Recorders. So, Susan created short videos of her playing each Recorder, and layered those videos on top of the image, too. What a perfect project! Deanna Mascle made a Tanka found poem, but her visual poetry via video composition is so peaceful and wonderful to watch. It pulls together many ideas in an ode to the entire CLMOOC community. A continuing project (no need for it to end) is the Found Poetry slideshow that Sheri Edwards put into play in the first Make Cycle. People have been remixing posts by others into found poetry and then adding them to the collective project. It’s a beautiful thing! Finally, for the second week, I had to miss the CLMOOC Twitter Chat, but I volunteered to Storify it afterwards. It’s so interesting to be the outside curator, following various threads of discussions and trying my best to capture the essence of the flow of the chat, while leaving much out. Those are my Five on this Friday. What did you find last week that inspired you? This entry was posted in CLMOOC. Bookmark the permalink.